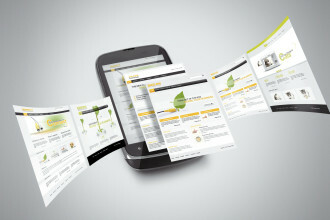 mobile - Archive - Your business needs a mobile website. If your business doesn't have a mobile website now, you have no idea how many customers you are losing every day. Read on to find out why you need to create a dedicated mobile optimised website, and how you are losing real customers. As you can imagine, the biggest limitation of a mobile website is size. For mobile phone users you have only three to four inches of screen size to play with. In case of tablet PC users, you have either seven or ten inches. In other words, you have to pack your message into a tiny screen. Another restriction is loading times. Mobile phone users won't wait for half a minute for the page to load. They expect the page to load in two seconds or less. If you take a close look at these restrictions, screen size and loading times are actually blessings in disguise. You can create tiny pages with very limited information and still get the attention of customers who are ready to buy from you. Your mobile site does not need all the text content you have in your regular desktop website. You also don't have to include any flash, video, large size images, etc., in the pages. All you need is enough information for the visitors to take an action - like calling you, ordering a product, or visiting your place of business. Only include as much information as needed. Then stop! Do not add more information than absolutely necessary to get your message across. The screen size does not allow you to show a lot of page detail. Plus, if you add more detail, it will affect the loading time. Show your visitors exactly what they can do to get your products or services. Keep the long text product copy for your regular desktop website. For your mobile optimised website, just make it straight and extremely easy for your customers to contact you or to buy from you. If you visit the mobile sites of major companies like Amazon, you will see that these sites load extremely fast. In other words, customers can reach their favourite website instantly. A tap on the bookmark or search result, and they are ready to shop. No waiting time. Average load time is around two seconds. Compare these dedicated mobile sites against the loading time of a traditional desktop site. Such websites have slow loading times, a big factor leading to lost leads and sales. With every extra second, you lose a customer - in most times, to your competitor. It is very bad for a hungry customer to go to your competitor's restaurant instead of yours. With a mobile site, you can get those people to your restaurant. The same is true for whatever local business you are running. The verdict is out. You need a fast loading website and you need a mobile optimised website to attract those customers, who'd otherwise turn to your competitors. Check out this video to learn more about why you need to develop a mobile site for your online business. We hope that you have found this blog post on What Do I Need To Create A Mobile Website helpful and informative. For further information please visit our Mobile Phone Website Design Page. Please feel free to comment. Your business needs a mobile website. If your business doesn’t have a mobile website now, you have no idea how many customers you are losing every day. Read on to find out why you need to create a dedicated mobile optimised website, and how you are losing real customers. As you can imagine, the biggest limitation of a mobile website is size. For mobile phone users you have only three to four inches of screen size to play with. In case of tablet PC users, you have either seven or ten inches. In other words, you have to pack your message into a tiny screen. Another restriction is loading times. Mobile phone users won’t wait for half a minute for the page to load. They expect the page to load in two seconds or less. If you take a close look at these restrictions, screen size and loading times are actually blessings in disguise. You can create tiny pages with very limited information and still get the attention of customers who are ready to buy from you. Your mobile site does not need all the text content you have in your regular desktop website. You also don’t have to include any flash, video, large size images, etc., in the pages. All you need is enough information for the visitors to take an action – like calling you, ordering a product, or visiting your place of business. Only include as much information as needed. Then stop! Do not add more information than absolutely necessary to get your message across. The screen size does not allow you to show a lot of page detail. Plus, if you add more detail, it will affect the loading time. Show your visitors exactly what they can do to get your products or services. Keep the long text product copy for your regular desktop website. For your mobile optimised website, just make it straight and extremely easy for your customers to contact you or to buy from you. If you visit the mobile sites of major companies like Amazon, you will see that these sites load extremely fast. In other words, customers can reach their favourite website instantly. A tap on the bookmark or search result, and they are ready to shop. No waiting time. Average load time is around two seconds. Compare these dedicated mobile sites against the loading time of a traditional desktop site. Such websites have slow loading times, a big factor leading to lost leads and sales. With every extra second, you lose a customer – in most times, to your competitor. It is very bad for a hungry customer to go to your competitor’s restaurant instead of yours. With a mobile site, you can get those people to your restaurant. The same is true for whatever local business you are running. The verdict is out. You need a fast loading website and you need a mobile optimised website to attract those customers, who’d otherwise turn to your competitors. Check out this video to learn more about why you need to develop a mobile site for your online business. We hope that you have found this blog post on What Do I Need To Create A Mobile Website helpful and informative. For further information please visit our Mobile Phone Website Design Page.